A powerful storm lashing rain, hail and lightening pounded San Diego County causing flooding and making for a frightening evening commute Wednesday. At the popular Fish Market restaurant across the street from the Del Mar racetrack, general manager Karen Mays watched as passing cars caused 3-foot waves to crash into the eatery, the North County Times reported. "Not too long ago, we saw a lifeguard boat go by on Via de la Valle," Mays said. "It was crazy." She told the paper a few water-stalled cars littered the street, and she watched one man pull on a wetsuit to help pull a car out of the water. "We had to close the restaurant," Mays said. Nobody can get to us. We are literally in a foot of water." A television crew covering the Tijuana River Valley was stranded along Monument Road at the Smuggler’s Gulch. The swift water rescue team responded but decided the crew didn’t need help, they needed to wait until the water level dropped. 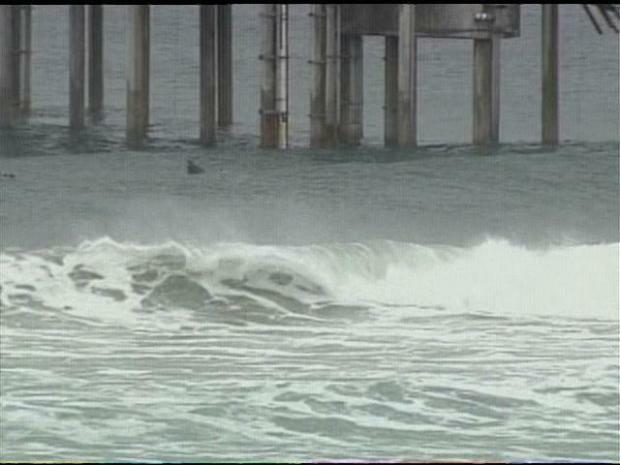 Raw video shot Tuesday along San Diego's coastline as the second in a series of winter storms slammed the county. A flash flood watch was in affect for the coast, valley and mountain areas until midnight. Additional heavy rainfall was expected Thursday into Friday, according to the National Weather Service. As of 6:30 p.m., San Diego Gas & Electric had reported 5300 customers without power. Their website offers details on the outages showing customers in the north county and Midway area were affected. This is the third of four storms expected this week. 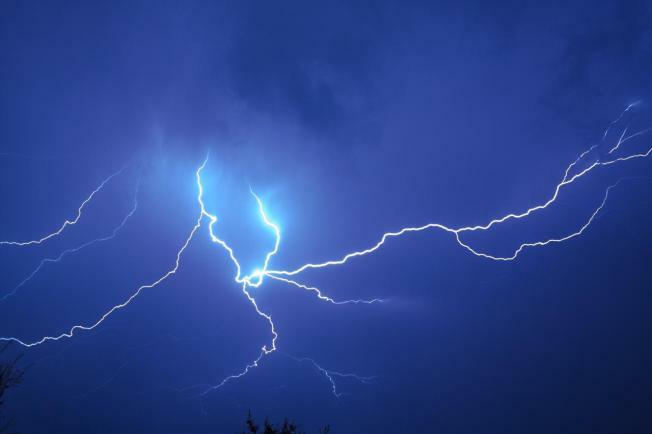 Forecaster Jodi Kodesh says someone described these powerful storms best on Facebook. “They called the first storm the left hook, the second storm the right hook, the third storm the upper cut and the fourth storm the sucker punch. That’s because the fourth storm is expected to be even more unstable and chaotic,” Kodesh said. Big surf started pounding the coast in Mission Beach Wednesday afternoon. Lifeguards were filling up sand bags at the Mission Beach Lifeguard headquarters to place in front of the headquarters' door. They say the water already made it past the seawall and onto the boardwalk at high tide just before noon and they're expecting bigger surf tomorrow. By nightfall, another powerful storm struck the Mission Beach area, causing flooding up and down Mission Boulevard. The roadway outside the Catamaran Resort looked like a lake for several hours because of the rising water. About a dozen cars were under about three feet of water. Some of them were just parked on the side of the road, others were stuck in the middle of Mission Boulevard. "I just made a bee line for the alley here and my exhaust got in the water,"said driver Mike Turk. He was stranded in the flooded roadway after trying to plow through the water. Lifeguards rescued several drivers from their cars, and helped push some cars to safety. In Lakeside, El Capitan High School was closed Wednesday because of a power outage. Crews were working on the problem but principal Sue Emerson called parents to inform them that school will be closed until further notice. The city of San Diego has ordered 37,000 sandbags after learning that fire stations around the city had run out or were close to running out. "We went through 11,000 bags since the last storm,” said Maurice Luque, spokesman for San Diego Fire and Rescue. "It's not an obligation for us to do it. But it is a courtesy that we've provided for a very long time. In fact this is the biggest run on sandbags we've seen in decades." Send your storm images to isee@nbcsandiego.com. Follow us on Twitter @nbcsandiego.